I am having some trouble understanding Math.tan() and Math.atan() and Math.atan2(). I have basic knowledge of trigonmetry but the usage of SIN, COS, and TAN etc for game development is very new to me. I am reading on some tutorials and I see that by using tangent we can get the angle in which one object needs to be rotated by how much to face another object for example my mouse. So why do we still need to use atan or atan2? Thus, if you know the values of both the opposite and adjacent sides (for example, by subtracting the object's coordinates from the mouse coordinates) you can get the value of the angle with atan. In game development though, it can happen fairly often that the adjacent side is equal to 0 (e.g. the x coordinate of a vector being 0). Remembering that tan(angle) = opposite/adjacent the potential for a disastrous divide-by-zero error should be clear. So a lot of libraries offer a function called atan2, which lets you specify both the x and y parameters, to avoid the division by zero for you and give an angle in the right quadrant. The use of trigonometry in game development is pretty common, especially with vectors, but usually libraries hide the trigonometry work for you. You can use sin/cos/tan for a lot of tasks which involve geometric manipulations to find a value from a triangle. All you need is 3 values (side lengths / angle values) to find the other values of a rectangle triangle, so it's quite useful. You can even use the "cycling" nature of the sine and cosine functions for special behaviors in a game, e.g. I've seen cos/sin used a lot to make an object turn around an other one. Here's a slightly different way of thinking about trig functions - including atan() and atan2() - that I find helpful (explanations in terms of "opposite/adjacent" just confuse me for some reason). You can get from one point to another by moving x units horizontally and y units vertically (called rectangular or Cartesian coordinates) or by moving distance r at an angle of Ɵ (called polar coordinates in 2D). Say we have a polar coordinate (r,Ɵ) and we want to convert it to (x,y). If r = 1 then x = cos(Ɵ). If r = 100 then x = 100 * cos(Ɵ). In general x = r * cos(Ɵ). If r = 1 then y = sin(Ɵ). If r = 100 then y = 100 * sin(Ɵ). In general y = r * sin(Ɵ). How about converting rectangular coordinate (x,y) into polar coordinate (r,Ɵ)? However, when performing y/x, calculating 3/4 gives the same answer as calculating -3/-4. Likewise -3/4 gives the same answer as 3/-4. So we have atan2(y,x) that handles the individual signs correctly and prevents a divide-by-zero/infinity error. Jesse and Sid are basically right, but I suspect you are really after insight into the problem. Atan2() is needed as atan() doesn't tell you the angle from the horizontal you need as it doesn't cope with quadrants. I will clarify a few things in a concise manner. Please refer to trigonometry tutorials online for a detailed explanation. Let a be an angle. Then tan(a) = tan(a+2*pi). atan is tan inverse, that is, gives you the angle given the tan. When you call atan(tan(a+2*pi)), the answer will be a. This will be inadequate for your application. atan2 will take 2 arguments to help this exact situations. atan takes x and y, which are basically cos(a) and sin(a). Please find some tutorials to explain why this is this way. One use for atan2 I found in my code is "signed angle". But this doesn't tell you which one "leads" (ie is "further ahead clockwise" than the other). This information may be important for gesture tracking. You could find the angle from the x axis (1,0) for both vectors, but there is this nasty problem of ambiguity: a vector with an angle of 315 degrees returns 45 degrees using the cos method above, and so does an angle of 45 degrees. You could do a sign check on y to fix that, or you could use atan2. // Returns + if this leads o. // more expensive than unsigned angle. Please Note atan is not broken. 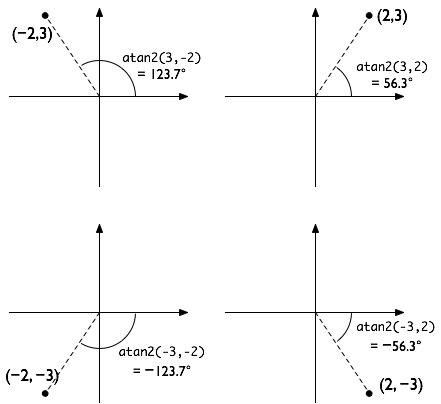 arctan or tan inverse is only a function between -PI/2 and PI/2. It repeats this pattern but then it isn't a function which is a problem for a computer as it doesn't handle multiple answers. so asin, acos and atan are the mathematical functions. Are there multiple valid definitions for what translate, rotate and scale do? What is Vector Projection and what is it's use in games? What formula is commonly used in rpg based games to calculate gained currency? Why aren't regular quadratic and cubic splines used much in games? What methods can be used to rotate a tiled structure?